Our Workforce, Defining Culture & Leading Engagement ... in Difficult Times. Brett has received wide recognition for his business and philanthropic leadership.He has been recognized as “Calgary Person of the Year” (2007), “Alberta Business Person of the Year” (2008), and “Nation Builder” by The Canadian Youth Business Foundation (2009). Brett has received Honorary Doctorate of Laws Degree’s from both the University of Saskatchewan (2015) and Royal Roads University (2010). He was also awarded the Order of Canada (2011), granted The Queen Elizabeth II Diamond Jubilee Medal (2011) and inducted into the Saskatchewan Order of Merit (2012). Brett’s best selling irreverent (and he says somewhat irrelevant) and revealing semi-autobiography, “Redefining Success: Still Making Mistakes” was published in November 2012. Dave Mowat is the President and CEO of ATB Financial, a company with 5,300 team members and 700,000 personal and business customers. A born-in-Alberta Albertan as well as a move-to-Alberta Albertan, Dave joined ATB in 2007 after leading Vancity Credit Union in Vancouver for 10 years. Dave serves on the boards of STARS, MasterCard Canada, Alberta Blue Cross and Edmonton’s Citadel Theatre. In 2012, Dave was named one of Alberta's 50 most influential people. In 2014, he was named MacEwan University's Charles Allard Chair in Business and Alberta Venture's Business Person of the Year and in 2015 received an honorary degree from SAIT. He recently led a citizen project to raise several million dollars to light Edmonton's High Level Bridge. (……so it is ready to celebrate the return of the Stanley Cup – LED bulbs have a very long life) To earn money and to gain perspective on life, Dave has done a bit of everything — including digging ditches. Mac Van Wielingen is a founder and director of ARC Financial Corporation, a private equity investment management company focused on the energy sector in Canada with approximately $5 billion of capital under management. He is also a founder and director of ARC Resources Ltd. He is one of the original directors (2007) and now Chairman of the Board of Directors of Alberta Investment Management Corporation, one of Canada's largest and most diversified institutional investment fund managers. He is President of Viewpoint Capital Corporation, a private family-owned investment company, President of Viewpoint Foundation, a private charitable foundation, and a co-founder and Chair of the Canadian Centre for Advanced Leadership at the Haskayne School of Business. He is a past director of numerous companies in the energy sector, and is active in various capacities in the community and the not-for-profit sector. He has received numerous forms of recognition including Chairman of the Year, Alberta Oil, 2015, Honorary Doctorate of Laws, University of Calgary, 2014, Distinguished Business Leader Award, 2014, and Ernest and Young Entrepreneur of Year, Prairies, 2011. Van Wielingen is an Honours graduate of the Ivey School of Business in finance and has studied post-graduate economics at Harvard University. Shannon was born an entrepreneur. Her mother, Laverne Bowen, founded BOWEN in 1974 and Shannon grew up in the business. She honed her skills in a variety of roles within the company including administration, recruiting, sales and marketing, human resources, and operations. In 1996, Shannon became BOWEN's President and CEO and under her leadership, the company has flourished, growing in size and service offerings. Today, with more than 31 years of experience in the recruitment industry in various leadership roles, Shannon is responsible for the overall success of BOWEN and for creating, planning, implementing, and integrating the strategic direction of the organization. During her tenure as President and CEO, the company has become a prominent leader in delivering contingent workforce management strategies with annual sales in excess of $75 million. BOWEN manages approximately 3,000 contingent workers across Canada annually. Under her leadership, BOWEN has been consistently ranked among Canada’s fastest growing companies on the annual Profit500. Most recently, BOWEN secured its Women’s Business Enterprise certification granted by Women’s Business Enterprises Canada. Shannon's personal success mirrors the company's growth. She is an inductee into the WXN's Canada's Most Powerful Women: Top 100™ Hall Of Fame and, was the recipient of the Alberta Women Entrepreneurs’ Celebration of Achievement Award for 2014. Most recently, Shannon was awarded with the Ernst & Young Entrepreneur of the Year Award for the Prairies region in Professional and Financial Services. Shannon volunteers her time and talents to several community and not-for-profit organizations. Most recently she was appointed to a three-year term on Travel Alberta’s Board of Directors. Keith Hanna - Author, CEO & Principal Coach - striving to be a renaissance man for our times. Keith Hanna is the founder of Stepup Coaching–an executive coaching and coach training business. For the past 18 years he has been the coach of choice for some of Canada’s premiere growth entrepreneurs and executive teams. Aspiring to be a renaissance man for our times, he works on aligning personal priorities, business strategy, stakeholder needs and tactical execution Keith is one of the pioneers of the executive coaching industry in Canada and is a former award-winning designer. He has spent his professional career studying entrepreneurial psychology, leadership and enterprise design, working together with his clients to develop innovative design and coaching tools that support their next level of growth. Keith works with people and organizations to reveal blindspots, shift mindsets and strengthen culture. His mission is to change the lives of the people changing the world by install coaching capacity inside their organizations. His long-term vision is a social network of innovators doing business and life with integrity. Keith is the author of three books on leadership: “Higher Purpose Higher Profit: Putting Core Values Into Service”; ”Stepup: Lead a Great Life and Build a Great Business.” and the forthcoming “Blindspotting: Revealing the Cultural Mindsets that Destroy Personal and Business Value”. He lives with his wife Tania and their Malamute sled dogs in Bragg Creek, Alberta, in the foothills of the Canadian Rockies. They are avid ice climbers, skiers, golfers and world travelers. They have two adult children out in the world pursuing their own creative passions. As the COO of DIRTT, Tracy has over 17 years of experience in the financial management industry and accountancy profession, including her roles as a consultant for the TSX Venture Exchange and Veritas DGC, a public oil and gas service company, and as the Senior Manager of Small Business Division at PricewaterhouseCoopers LLP. She is a member of the Institute of Chartered Accountants of Alberta. She oversees the strategic direction and daily operations of DIRTT’s four factories located in Calgary, AB, Savannah, GA, Phoenix, AZ and Kelowna, BC. Her team of over 500 people is involved in order engineering, procurement, production and logistics, working with project managers and field technicians to provide custom products in an extremely short time line. Since she joined the company in 2004, DIRTT’s revenue has increased by 1,052%. Her background as an accountant means she understands the big-picture financial implications of plant operations. She was a leader in helping DIRTT create KPIs that reflect true business performance and ultimately affect customer satisfaction and the bottom line. Tracy also has a talent for being empathetic and working with people’s strengths. She credits a couple of outstanding mentors with helping her grow the skills she needed to succeed, and because of their impact, Tracy now makes mentoring others a priority. Tracy empowers DIRTT factory employees to create solutions to their everyday inconveniences. She also has strong team-building skills which are important in fostering a lean manufacturing environment. From soap to television to airlines - Richard Bartrem is WestJet’s Vice-President, Marketing Communications. His responsibilities include overseeing WestJet’s marketing, public relations, social media, community investment, sponsorship and creative services. He joined WestJet in 2005 as Director, Brand and Communications and became Vice-President, Communications and Culture in 2007. Richard began his career with Unilever in 1988 where, over the next twelve years, he held a variety of sales and marketing positions in Montréal, Halifax, Calgary and Toronto. Richard left Unilever in 2000 and spent five years working for Astral Media in television in Toronto and was responsible for marketing for The Movie Network and Mpix brands. A native of Montréal, Richard now resides in Calgary with his wife and two children. His favourite WestJet destination is Maui and he will often choose the free snack mix over the cookies available free on board WestJet flights. Who's Dan? - As the President and a partner in one of Alberta's largest, full service agencies for the past 13 years, I’ve been fortunate enough to work with a team that makes every day exciting with their energy and innovation – ours is not a team you lead, it’s a team you stay out of their way and see what they create. So far, so great. In his short time at BOWEN, Benjamin has helped position the company as a leader in contingent workforce management, providing sourcing and managing solutions to energy companies in Western Canada, especially as it pertains to field operations. In this role, Benjamin provides guidance and oversight to BOWEN’s leadership team, ensuring BOWEN’s continued success within all areas of the business. He does this through a balanced scorecard approach to management – which provides a continuous and equal focus on our company, team, clients and candidates. As Vice President Corporate Development, and a member of our executive team, Benjamin is responsible for creating, planning, implementing, and integrating the strategic direction of the organization. His focus is on developing a commercialization strategy for new offerings and leads our team in bringing relevant and timely services to market. Prior to joining BOWEN, Benjamin held numerous leadership roles managing top performing teams and led a strategy engagement model across global operations for a Fortune 500 company. In this role, he was responsible for driving revenue and mentoring top performing teams. During his tenure, he secured global MSA with strategic vendor status and established executive alignment on three transformational projects that represented significant revenues for the business. He is a recipient of the company’s prestigious president’s “Building Human Capital,” award and has earned national recognition for leadership within the organization. Benjamin holds an honours degree in international business strategy from Teesside University. He brings an entrepreneurial drive to BOWEN, helping us to create something new and different in the market place. With more than 30 years of oil and gas industry experience, Debbie has been actively delivering strategic contingent workforce management services to local, national and global companies operating in the energy sector. Her experience includes HR generalist business support, international recruiting from throughout North America, staffing service provider selection, reviews of contractor management practices to manage costs, and evaluating options for managing a contingent workforce. Throughout her career, Debbie has worked with global exploration and production companies, including five years with Westcoast Energy/Spectra Energy, one of North American’s leading pipeline and midstream companies. As Vice President, Operations at BOWEN, Debbie drives strategic processes and is responsible for overseeing our contingent workforce management services, recruitment and outsourced HR solutions. For nearly 10 years, Debbie has spearheaded BOWEN’s contract management practices, policies and operations including, negotiating contracts, designing solutions and ensuring project completion. Debbie is well-versed on Canadian employment law and regulatory framework and has an in-depth knowledge of the employment market in Canada. With her knowledge, Debbie has been actively involved in the labor supply/demand research for the Petroleum HR Council and led the development of BOWEN’s Health and Safety program to become COR certified. An active community volunteer, Debbie currently sits on the board for The Calgary Bridge Foundation for Youth (CBFY), a charitable, not-for-profit organization that provides settlement services and support to immigrant youth and families in the Calgary region. Adam’s desire to help entrepreneurial families has shaped his professional development; from his tax expertise, to his charitable work and including a focus on trust advisory and administration. Adam has helped many families startup new or growing businesses and often assists in their ongoing business affairs. Adam has experience in all areas of Canadian tax law, with particular emphasis on business reorganizations and asset protection. Adam is also an officer of a startup technology company and sits on the Board of Trustees of several private family trusts. Wellington is passionate about entrepreneurship and small business and he has dedicated his career to finding new ways to help Alberta businesses excel, in an increasingly complex world. As Executive Vice-President at ATB Financial, he leads a team of over 500 business professionals, all committed to make banking work for people and to help entrepreneurs, farmers and ranchers, find a strong path forward. Educated in business at the University of Manitoba, and with a Masters from the University of Oxford, he is hungry to continue exploring new ideas that contribute to making Alberta, and Canada, a better place to be in business and to do business. Born in Edmonton but having lived and worked in many regions of Canada, Wellington brings a unique perspective on the opportunities we all have as we work together to make our province, and our country, a better place to be. Sean Young is an award winning entrepreneur and Top 40 under 40 alumnus. He is credited with registering and launching one of the first 10 commercial websites on the web back in 1995. He went on to pioneering the first B2B software-enabled-service (SeS) model and has been on the leading edge of technology innovations in the fields of remote workforce deployment, the sharing economy and HRIS. As a serial entrepreneur, digital disruptor & innovator Sean currently manages a portfolio of entrepreneurial activities along with his role as a Coach & Mentor with StepUp Coaching. CHAD SARTISON – Career Firefighter-Captain / Entrepreneur Along with a well-established 19-year career in the financial industry, Chad was recognized by Calgary Inc. magazine as one of Calgary’s Top 40 Under 40 entrepreneurs in 2007. It’s hard to believe that in 2007 Chad also managed to fit in a battle with cancer enduring six months of surgery and chemotherapy while simultaneously founding an organization that expanded across Canada and into the United States. Inspired by his own personal experiences as a volunteer firefighter in the Alberta Foothills, Chad founded The Fire Within in 2004 which designed and developed programs that raised in excess of 3.5 million dollars for volunteer firefighters across North America and has donated an additional 1/2 million dollars in equipment and training. Speaking in both Canada and the United States addressing issues surrounding fire department volunteerism and funding, Chad’s initiatives quickly began to shape the future of volunteer firefighting. Chad also sat on the Ottawa board of the Canadian Fallen Firefighters Foundation and was one of three Canadians invited to participate in the International Fire Chiefs Association Summit on Recruitment and Retention in Washington DC. Inspired by surviving his cancer and an inextinguishable desire to contribute, Chad underwent a career transformation in 2012 and accepted a position as a full-time career Captain with the Foothills Fire Department. Here he continues to hone his skills, tirelessly giving back to his peers and community. ATB Financial - At ATB Financial, we put people first. We've been doing it for more than 75 years. In that time, we've grown from one small Treasury Branch to become the largest Alberta-based financial institution, with assets of $43.1 billion. Today, 5,300 team members help more than 710,000 customers in 244 Alberta communities. Like our clients, we're Albertans. Through a network of 172 branches, 135 agencies, and a Customer Care Centre, we work beside them and with them in their communities, and we root for their success because it's our success too. We're proud of what we do and we're proud of the people who help us do it. ATB was named one of Canada’s 50 Best Employers in 2015 by Maclean’s Magazine in partnership with Aon Hewitt – in fact we made to the top 10! In 2014, ATB was also named one of Alberta's top 65 employers and one of Canada's Best Employers for Young People by Mediacorp Canada Inc., one of Canada's Passion Capitalists by Knightsbridge, and one of the 50 Most Engaged Workplaces in Canada by Achievers. For more than 40 years, BOWEN has been providing corporate Canada cost-driven sourcing and contractor management solutions. From managing highly complex recruiting projects to developing contractor engagement and performance models we are changing the market landscape in terms of how talent is sourced and how workforces operate. Our business focus is on consistent execution, disciplined financial results and sustainable operational over-sight. Our results are measured entirely by our capacity to meaningfully reduce time and cost while also increasing output and performance efficiency. We care about doing business right, mitigating risk, ensuring safety and driving value. We are more than a vendor. We are a strategic business partner. Full-service marketing communications firm with offices in Calgary and Edmonton, servicing Alberta-based industries with a focus on driving customer engagement and conversion. SNC Law - Shea Nerland Calnan LLP is a premier Calgary-based tax and business law firm. We assist our clients by providing tailored solutions to both domestic and international business issues. Our success is based on developing meaningful client relationships, building experience and knowledge in highly specialized areas of the law, applying a business-minded approach to the practice of law and being particularly attentive to personal service and quality. Collins Barrow Calgary LLP - A founding member of the Collins Barrow network, we have been providing audit and assurance, tax and business advisory services to a diverse client base for over 87 years. With more than 100 team members, we offer resources and personalized, responsive service to local owner-managed businesses, private enterprises, public companies and not-for-profit organizations. Honoured for the fourth consecutive year with Alberta’s Top 55 Employers’ Award, what sets us apart is our entrepreneurial approach, proven practices and people-first focus. We listen to our clients and work to understand their businesses so we can tailor strategies that deliver excellent results and build positive, long-term relationships. My passion is exposing the experiences and personalities that surround us everyday. I bring to the surface that which is often missed or left undiscovered in a world where it’s more popular to talk, than it is to truly listen. It’s that unrecognized beauty that exists around every corner that drives me to search out, to feel and to remain open to awe-inspiring moments - whenever they hit - so that I can share what I uncover with those who can benefit from its inspiration. Because at the end of the day, that’s what photography is all about: the connection between subject and audience, where like minds and common interests are discovered, nurtured and celebrated. Harry Rosen - Canada's leading menswear retailer. StepUp Coaching Inc - Our business is helping high-growth mid-sized companies and their leaders to build great businesses and lead great lives. We do this by applying the StepUp program to create valuable change that results in tangible, lasting results. Why high-growth companies & successful entrepreneurs? Because we understand the stresses that result from creating something of value. We work with people just like you who are facing the same challenges and opportunities you are. Our StepUp program was designed specifically to address these issues by aligning language, core values and business systems to generate meaningful results. Sean Young is an award winning tech-entrepreneur. He has passion for leading high performance teams to revitalize existing companies and establish platforms for dramatic growth. Over 25 years of experience in a variety of senior IT, Sales, Marketing, Operation and Management roles. Blends an understanding of market dynamics with a sense of innovation and go to market strategies. Track record includes a string of successful projects - helping companies create promising new tech-enabled services and driving successful market adoption. Additional Specialties: Project Management, Team building, Software, Internet B2B, SaaS and web-based IT solutions, Real Estate Development, Service Excellence. Join W Brett Wilson for an up close and personal breakfast and informal networking before the main program begins. Most seats are invitation only, however a small number of tickets may be available here. Questions? 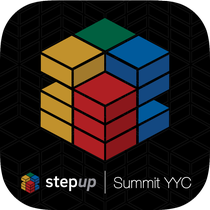 Contacted the event organizer directly at vip@stepup.net. We will begin General Registration at 7:30AM outside the Spectrum 5 Room. Hot Beverage service will be available ahead of the main program and throughout the day. The main program begins at 8:30AM. Our keynote speaker W Brett Wilson will share their perspective and experience to inform us on the challenges and opportunities of leadership at during this difficult time for Alberta business, workers and families. The session will begin with opening remarks, a keynote address followed by an Open Mic period for audience driven Q & A. This is a structured break that will be lead by StepUp Principal Coach Keith Hanna. Mac Van Wielingen, Founder & Director of ARC Financial will lead a panel of prominent Alberta business leaders through an exploration of sustainability, culture and engagement - and why this current crisis makes them more important to top executives than ever before. Our working lunch will allow participants to explore a personal & professional sustainability vision and engagement challenge. The day will close with an address from Wellington Holbrook, Executive Vice President, Business & Agriculture at ATB Financial.